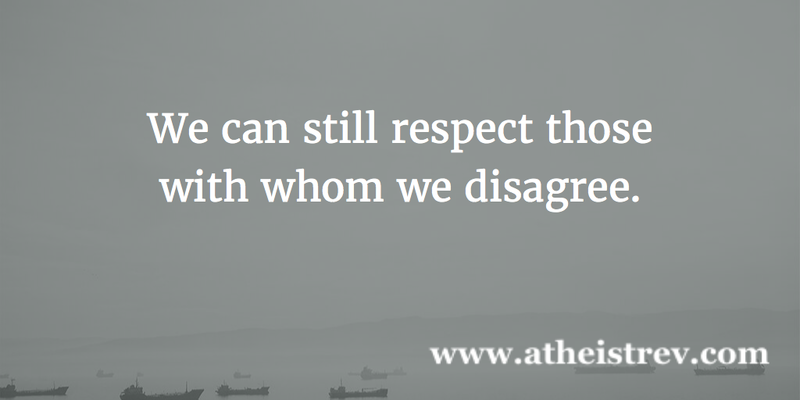 I respect many people with whom I rarely agree on matters of religion, politics, or practically anything else. I can recognize their intelligence, kindness, and other positive attributes even though I disagree with them on many issues. I read their work and watch their videos, regularly finding something of value. I enjoy spending time with some of them in my daily life. The fact that I do not share their god belief or have different political views rarely prevents me from respecting them. I realize that everything I said above may strike some people as quite strange. For me, this is part of what it means to be reasonable. It is part of what it means to be a freethinker. It is something to which I aspire while acknowledging that I still have work to do in order to get where I'd like to be. If I were to angrily attack or demonize others just for holding different opinions, I would be the one who would pay the price. It would be my loss, and I'd prefer not to deprive myself of the opportunity to be stimulated, challenged, or confronted by diverse views.